("fire stop thief help murder save the world"
Not only does the new CD feature new readings, as far as I can tell, all but three (“Buffalo Bill ’s,” “in Just-,” and “next to of course god america i”) of the readings on Voice of the Poet: E.E. Cummings are different recordings from those done for the Harper Collins compilation. Thus for some of the poems, we can compare two versions of EEC’s performance of the same poem. There is also on the new Voice recording one curious anomaly: after the recording of “a salesman is an it that stinks Excuse” we hear EEC reading “a politician is an arse upon.” Apparently, the editor thought this was part of the same poem? At any rate, a bonus track. Webster, Michael. "Audio Cummings." EEC Society Blog (21 Aug. 2015). Web. Cummings reading at the 92nd Street Y (New York City, October 20, 1949). The 92nd Street Y has released Cummings' entire reading. They have also released a You Tube version of the same reading. 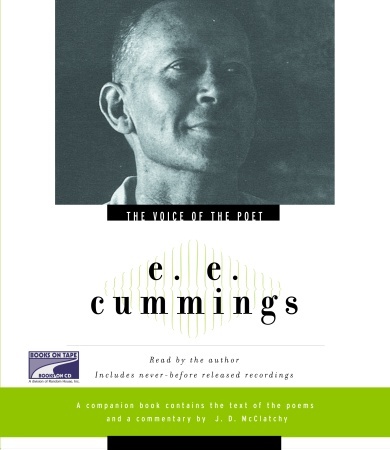 The Poetry Archive presents Cummings reading two poems: "anyone lived in a pretty how town" (CP 515) and " 'next to of course god america i" (CP 267). Recorded by the BBC, date unknown. The UBU web Cummings sound page offers recordings of "that melancholy" (CP 697) and "let's,from some loud unworld's most rightful wrong" (CP 745). In certain poems the audio version differs from the printed text. Some Cummings Links . . .